Are Bulls Back on D-Street? Stopping out of losing positions is the only sure way to maintain survival in difficult conflicts and to achieve the complete victory that is your aim. To learn how to live to fight another day is the best advice that all traders can be given. Nifty Hourly resisted at Hourly Resistance of 4931 and looking at global cues should open gap up again of 30 Points. 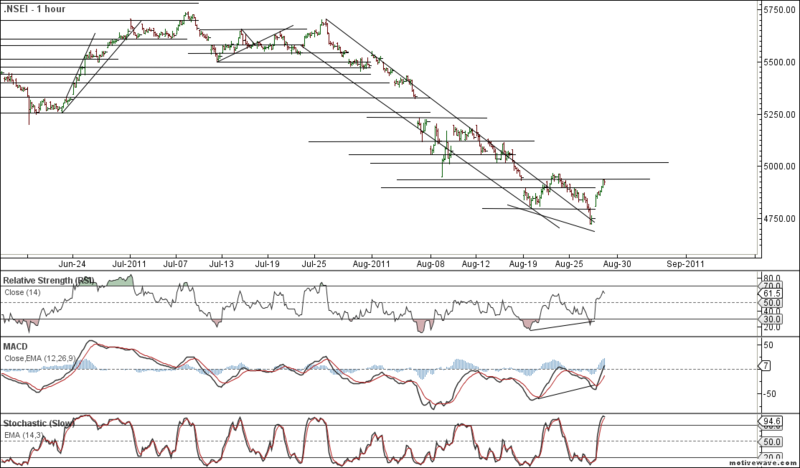 5015 is the level for short term reversal and Shorts should keep the same as SL. As discussed in Weekly Charts Nifty has formed a falling wedge with positive divergence which has attributed in Yesterday rise. On Daily Chart Nifty is trading in a parallel channel with resistance at 4940 break of the same will lead to break above the channel. 4965 is the level to be watched as this is the level where Nifty as this is the level where market has sold off in past. FII Bought 45000 Contract in NF and Rise in Nifty can be more attributed to Short Covering as Open Interest in Down by 10 Lakh Contracts. 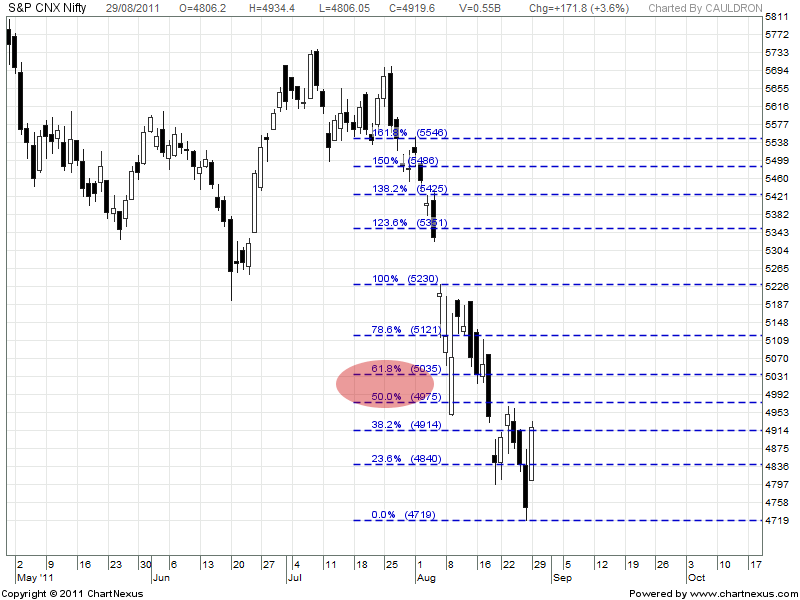 As per Fibo 61.8% Retracement comes at 5035 which can be potential resistance for this upmove. 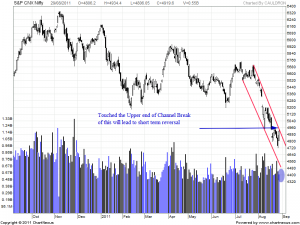 Category: Nifty Technical Analysis Technical Analysis of Nifty Tags: Are Bulls Back on D-Street? 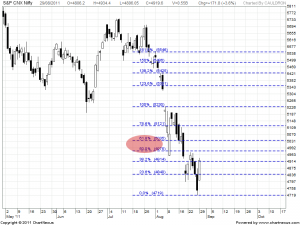 Nifty made a high of 4998 could not hild 4970 and tested first support 4940 and retraced to 4970. Now, 4970 is crucial and as indicated already any stregth above 4970 would lead to 5040. 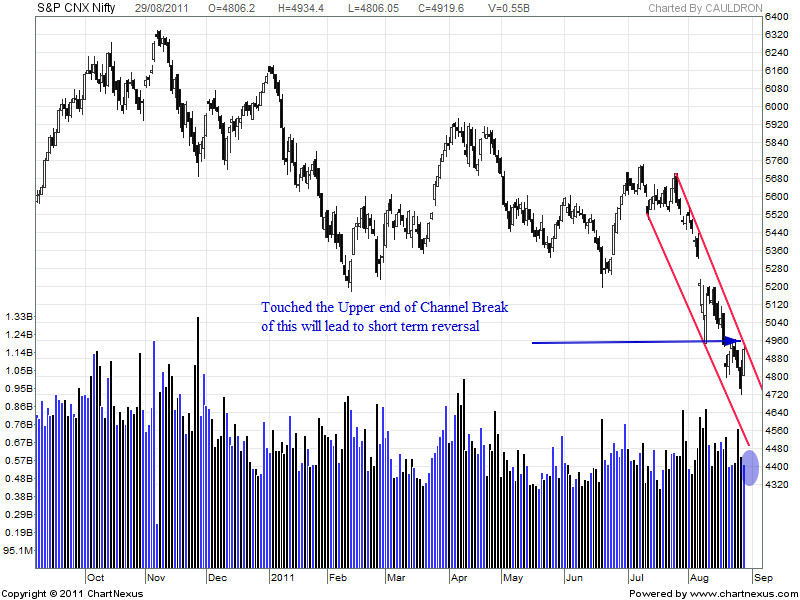 As long as Nifty stays above 4900 ( SAR level now) shorts will not yield much. That is what my system says. As posted, Nifty closed above our SAR level 4872 and forced me to carry my longs. We had a gap up opening today. 50% longs booked. What is in store for today. 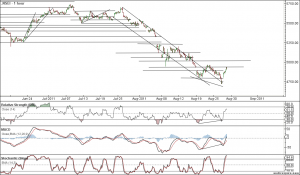 Holding 4970, nifty can target 5040.Any weakness is below 4970. The SAR level for today 4890. There is a reversal only below 4890. Please also refer my monthly chart where I have viewd that Nifty will close month end above 4840.